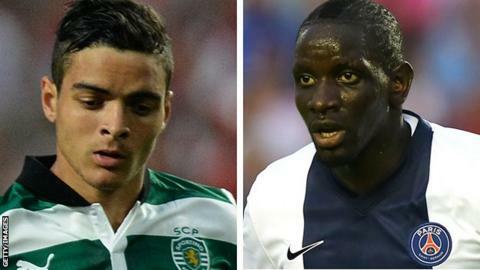 Liverpool have signed central defenders Mamadou Sakho and Tiago Ilori for a combined fee of about £25m. Sakho, 23, who has 14 France caps, will cost around £18m from Paris St-Germain. Sporting Lisbon's Ilori, 20, has represented Portugal at youth level but is still eligible to play for England because he is born in London. Sakho told the club's website: "I came here because the project at Liverpool interests me. I'm really looking forward to playing my first game." He is manager Brendan Rodgers's most expensive signing of the summer and can play in the centre of defence as well as at left-back. Liverpool managing director Ian Ayre said: "He's an important marquee signing for us. It was a difficult one to do and it was a difficult one for us to get, but I'm very pleased that we've been able to attract him to the club." Ilori, who cost £7m, said: "Liverpool have a great team and I think it's the place for me to be at the moment. "There have been some great teams here in the past, the club has won a lot of trophies and I want to be a part of it." Rodgers has now signed seven players this summer following the captures of defender Kolo Toure, striker Iago Aspas, winger Luis Alberto, goalkeeper Simon Mignolet and left-back Aly Cissokho. Liverpool prioritised defensive recruitments because Sebastian Coates has been ruled out for most of the season while Toure and Cissokho are also injured. Sakho and Ilori were both at Anfield on Sunday to watch Liverpool beat Manchester United to move top of the Premier League. Meanwhile, forward Daniel Pacheco has left Liverpool to join Spanish second tier side AD Alcorcon. The 22-year-old had struggled to break into the Reds first-team and failed to score in his 17 senior appearances during his six years with the Merseysiders. He was sent out on loan to Rayo Vallecano, Norwich City and Huesca but has now moved to Alcorcon on a permanent basis. I will always be a red," tweeted Pacheco. "It's been my house and I will never forget it. Thanks to all you fans for the support and hope we celebrate the Premier League [title] this season."